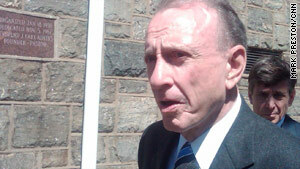 Sen. Arlen Specter, who switched to the Democratic Party last year, has the support of President Obama. Philadelphia, Pennsylvania (CNN) -- With little fanfare, Rep. Joe Sestak walked into Mount Ephraim Baptist Church on Sunday and quickly headed for a pew near the back of this African-American church. Few of the 70 members of the congregation would have noticed the congressman if not for the handful of reporters who hustled in right behind him to record this moment of time-honored Democratic campaigning: a plea for the black vote. Sestak, a two-term congressman hoping to defeat Republican-turned-Democratic Sen. Arlen Specter in Tuesday's Senate primary, sat alone in the pew for 30 minutes as a sermon was delivered and a family welcomed to the front. And then it was time for the retired Navy admiral turned congressman to make his pitch. Sestak highlighted his military career; his ties to former President Clinton; his young daughter's triumph over brain cancer; and his pledge to work hard on issues of importance to the African-American community. He closed by asking church members for their support. Sestak received polite applause, a few people stood up, and he went back to the pew, alone. The congressman sat for another 10 minutes before leaving the church and heading to the next congregation to make another pitch. An hour earlier, it was quite a different scene at Mount Ephraim, but with the same "ask." Specter entered the church with a small entourage, escorted down a corridor to the front where he was given a seat in the first pew. It was no time before Specter stood before the congregation, received a standing ovation and made his own pitch for members' votes: His seniority in Washington has helped -- and will continue to help -- deliver for their community. Then he pulled an ace from his back pocket: President Obama and the Black Clergy of Philadelphia both endorsed him in the primary. Specter exited the church and before he was whisked off to another event, a few people on the street walked up and shook his hand. Even though he is a former Republican, Specter is known in traditionally Democratic Philadelphia neighborhoods. The power of incumbency was on full display. "What I heard was a legacy of support for the commonwealth of Pennsylvania and Philadelphia from Arlen Specter," said Simm Renwick, a 64-year-old who recently retired. Renwick noted that it was Specter who helped him with his "paperwork" a few years after he returned home from Vietnam. "I am basically at this point an Arlen Specter supporter," he said. So is the Democratic establishment in this commonwealth, known for its machine politics, as well as the national Democratic establishment, led by Obama. The irony of this contest is that these same Democrats were asking Sestak to consider challenging Specter in the 2010 midterms -- that is, until Specter left the GOP to join the Democratic Party. The recruitment effort quickly ended. Specter effectively gave Obama the 60th vote he needed to overcome GOP filibusters and the president embraced the former Republican. But a problem remained for the establishment -- Sestak didn't stop thinking about the race and eventually declared his candidacy. Sestak said on Sunday that he understands Obama's decision to back Specter, yet he looks forward to his support after Tuesday's primary. "I have absolutely no doubt that once we win this race, that this president really wanted a true Democrat," Sestak said after speaking to the Mount Ephraim congregation. "And we're going to work very well together. As a matter of fact I'm going to be humbled to have his support." Just a few months ago, Sestak would have had little to back up this bold claim. He was trailing in the polls and lacked the resources needed to mount a strong campaign against Specter. But the political tide recently turned for the retired admiral, and now, heading into primary day, the election is up for grabs. Despite Specter's support from Obama, Gov. Ed Rendell, and organized labor, there are enough Democratic base voters who look at the former Republican turned Democrat with a wary eye. And the anti-incumbent mood sweeping across the nation seems to have crossed the border into Pennsylvania. Specter, who is known for his ability to prevail in close elections, seems well aware of his challenges heading into primary day. Both candidates will make stops throughout the state Monday in an 11th-hour hunt for votes, but for Specter, a win or loss might come down to how effective he was at winning the support of attendees at Mount Ephraim and the handful of other African-American churches he visited. "Well, the black vote is critical, maybe decisive, and it's nice to have the endorsement of the Black Clergy," Specter said. "The Black Clergy have endorsed me because of what I've done." For Denise Selby, a 52-year-old nurse, the Black Clergy's endorsement doesn't matter, but Specter's support of Obama's stimulus bill does carry weight. "I'm still weighing my options as far as who I'm going to vote for," she said. "I don't like for anyone to [try to] persuade me as to who I think my choice would be. Whoever is the better person, that's who I'll choose." On Tuesday, Specter and Sestak will be competing for the "Denise Selby" votes.